We've been quite pleased with the reception for the very first BitF Fan Art Competition! Rest assured that it was somewhat of a headache narrowing down our favorites, and there was quite a bit of discussion between Chris and myself on which pieces are our favorites. Here's how this thread will work--we're highlighting our favorite pieces from the June competition, and leaving a link to this thread itself in the Fan Works section of the site. That way, many pieces of art will still be showcased...but only one will enjoy a permanent spot on the page of the Fan Works section! 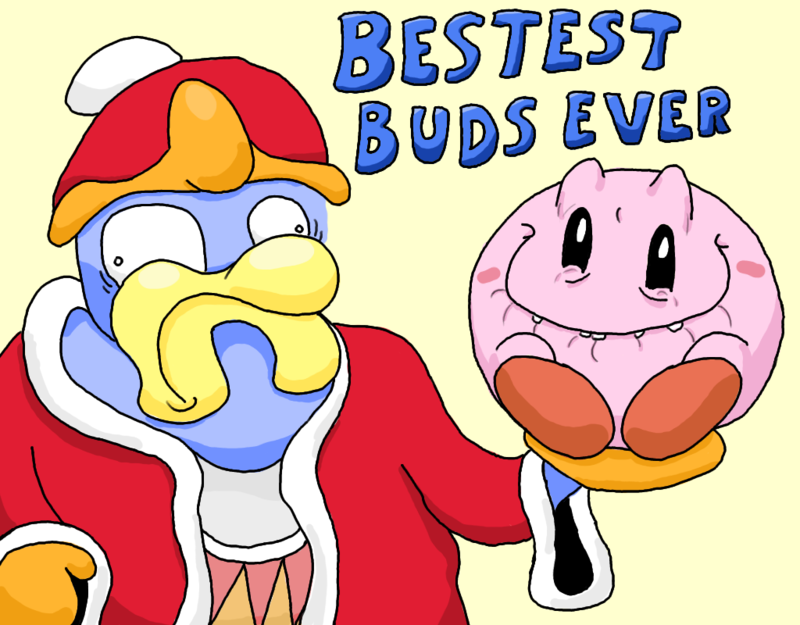 The color pencil is a nice effect, and this image sums up Dedede and Kirby's relationship quite well. From newcomer Clandy comes this lovely piece that suits the pair admirably. 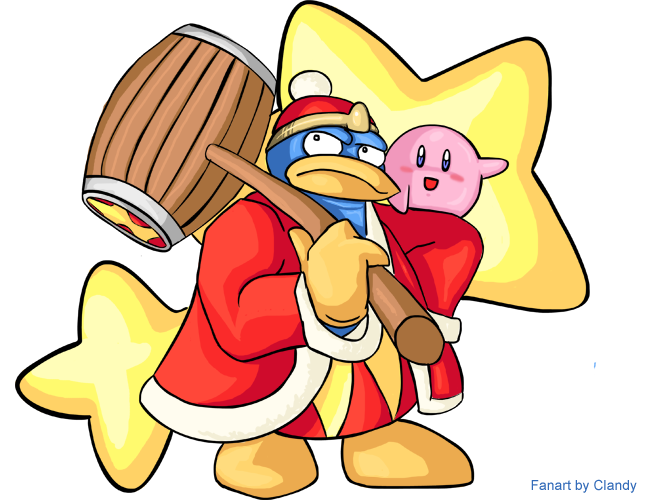 Dedede's always wanted to "get" that Kirby, after all! The detail and shading look very professional here. I enjoy seeing alternate takes on familiar imagery, so this film noir style piece caught my eye right away! We received several comic-style art pieces as well, which are always fun. 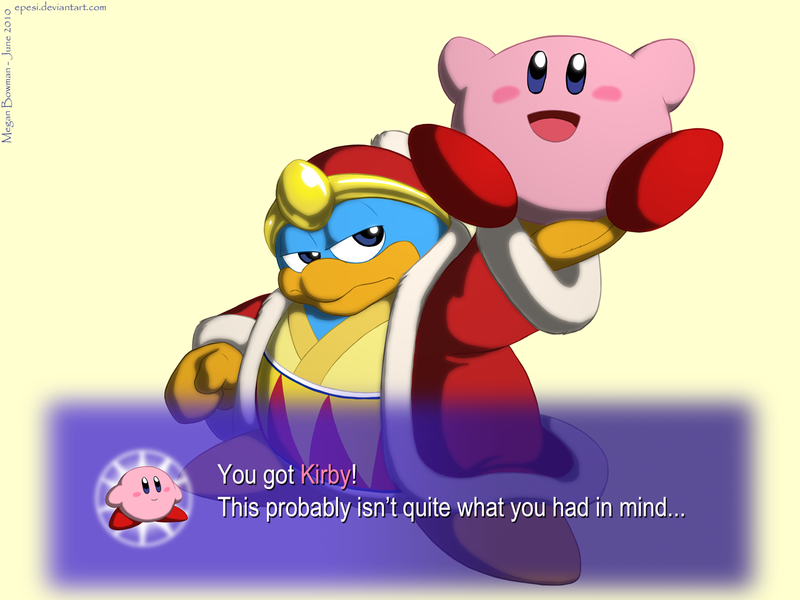 This image is quite cute and I love Kirby's weary expression in the end, as well as the implicit eating of Dedede. Nothing like a little weirdness to brighten your day! Outlandish expressions and excess silliness make this a solid representation of the spirit of BitF. This work is particularly well-drawn and I'm a fan of the slightly exaggerated proportions. 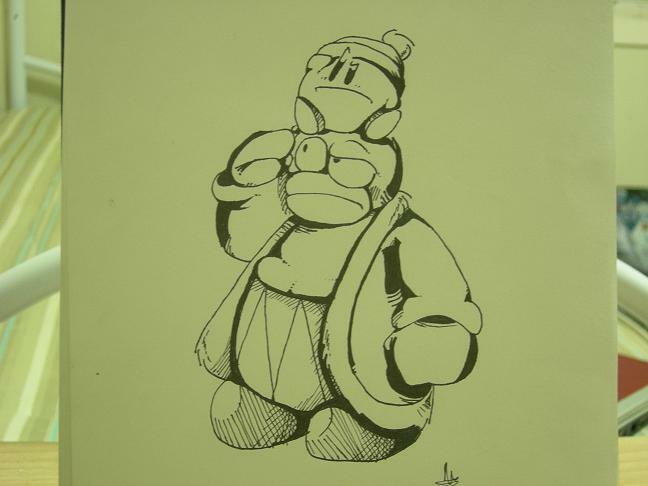 I also like seeing the more BitF-esque Dedede...although in the future, something like this would be better off scanned directly into the computer. Here we have a rather clever idea--a dramatic "remake" of the very first BitF comic, complete with blue line art at the end. And when the dust clears, only one of them can be left standing. 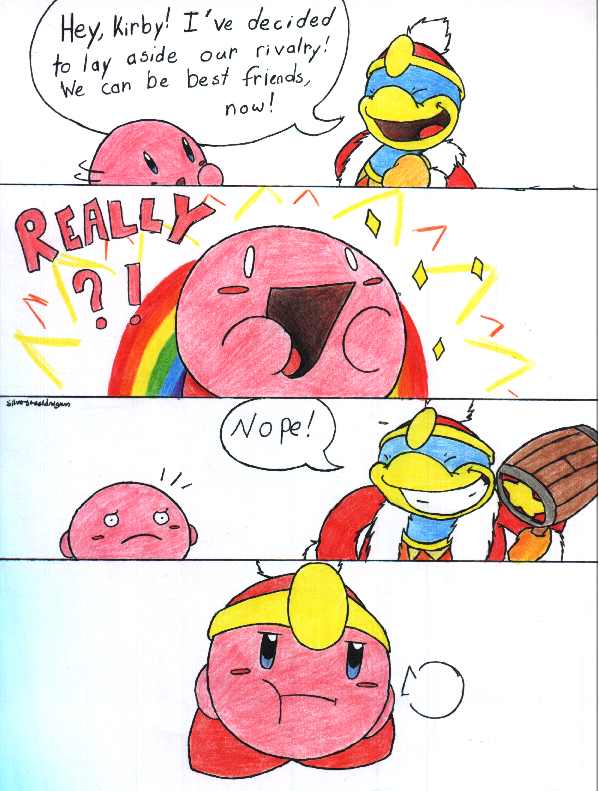 Another amusing comic, this time centering around Dedede's strange name. I like the nod to the old Tootsie Pop commercial, and Majora's Mask! Very cute, simple and effective. 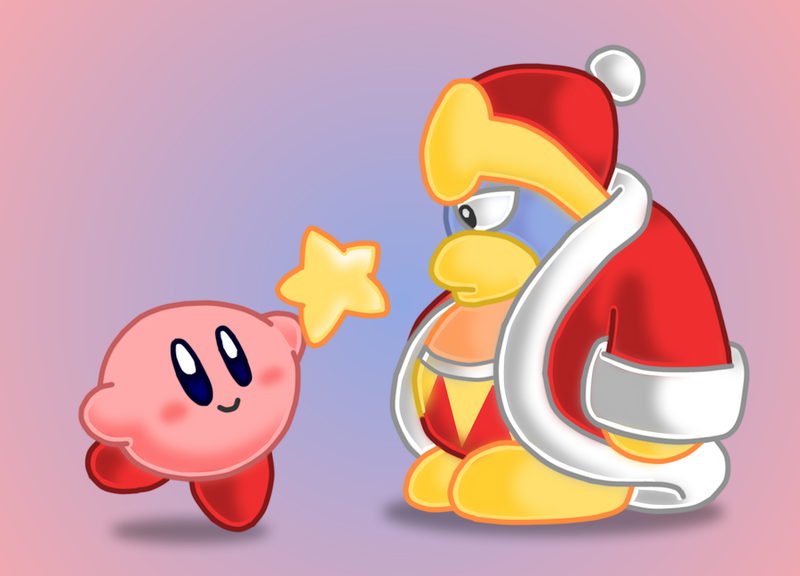 Like BoringRocks' entry, this work sums up Kirby and Dedede's relationship very succinctly. 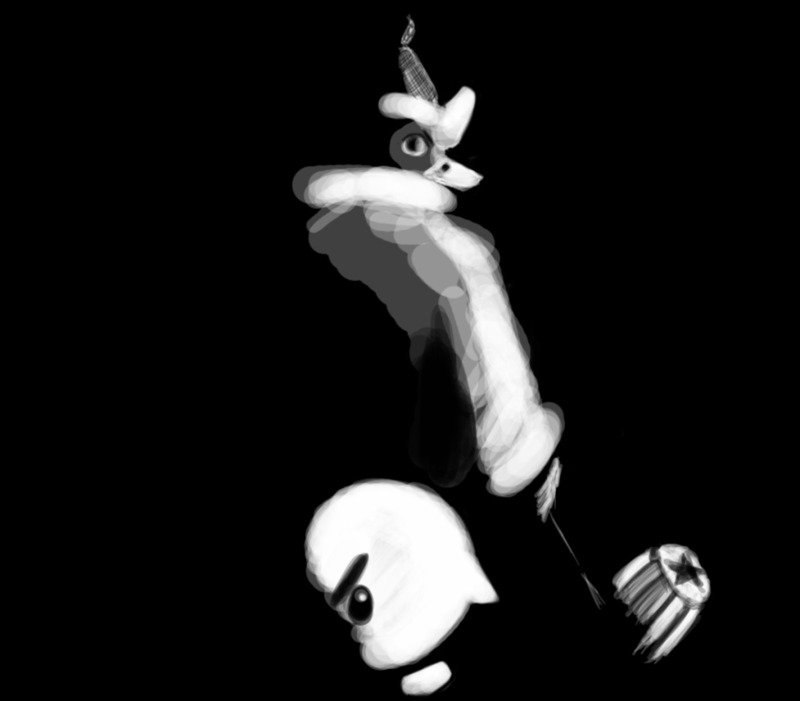 Clandy's Submission! 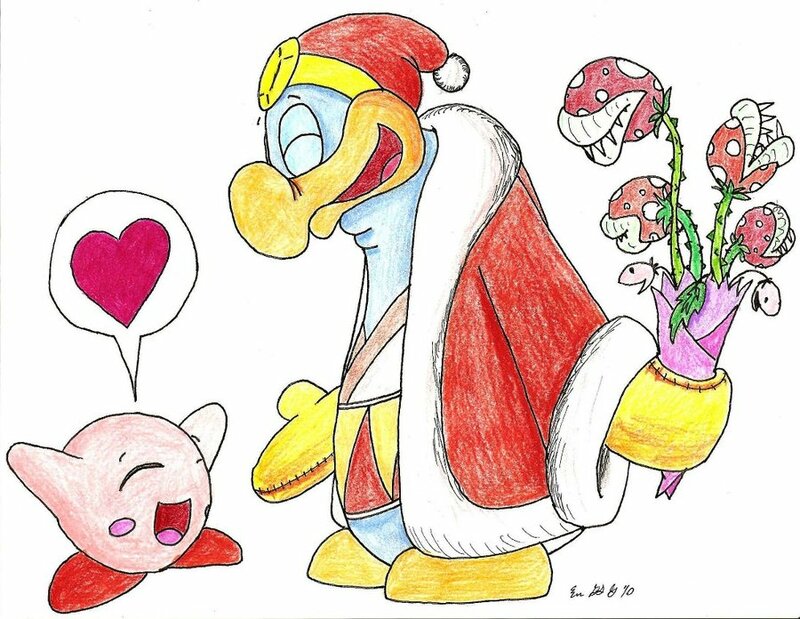 We liked this not only for the great use of color, shading, composition and linework, but because it captured the essence of Kirby and Dedede quite well. The posing is expressive and the stars are a nice touch. Great job, Clandy! I'm wondering if there's a larger (wallpaper-sized) version out there, though. So that concludes June's contest! The full thread of contestants can be found here, or if you'd like to shoot for an entry in the new July contest, just click here. See you next month! Last edited by TriforceBun; July 5th, 2010 at 10:55 PM. We were both really blown away by the quality of the submissions we got. Thanks to everyone who entered the contest! We hope you'll make something for July's contest, too. Last edited by fiftyeighthens; July 5th, 2010 at 07:47 PM.